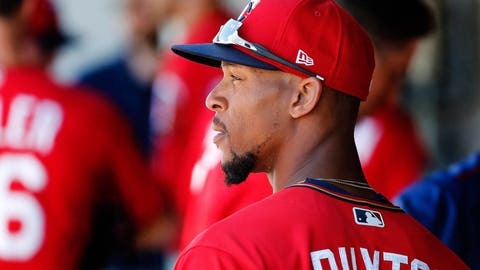 MINNEAPOLIS — Minnesota Twins center fielder Byron Buxton was pulled from the game on Thursday against Oakland after running into the wall while tracking down a flyball in the fifth inning. The Twins say he was pulled for precautionary reasons and passed all the initial concussion tests. He will be evaluated again on Friday before the Twins start a series against Boston. With two outs in the fifth, Matt Joyce sent a drive to deep left-center field. Buxton raced to make the catch, but slammed into the wall so hard that his hat fell off. He bent over for a few moments before trotting back to the dugout, and did not return to the game.